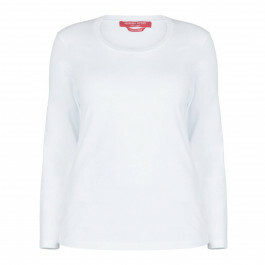 A high quality long-sleeve round neck cotton stretch top is the ultimate layering piece and a mainstay of every well-concieved capsule wardrobe. Made by Marina Rinaldi so you can be assured of the highest quality. It's also designed specifically with the voluptous woman in mind so the length is long and it's oh-so-nicely propotioned. 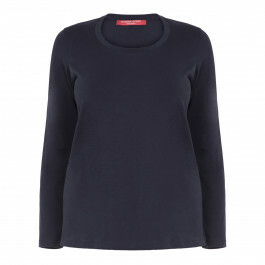 Perfect under a business suit or teamed with jeans and a cardi at the weekend. Black straight T-shirt in stretch cotton jersey with round neck, long sleeves and branding in rhinestone on the back. 92% cotton, 8% elastane. Wash in the washing machine at max 30 °C with reduced mechanical action. Do not bleach. Cool iron max 110 °C. Delicately dry clean using perchloroehylene. Do not tumble dry. Flat drying in the shade. Professional wet cleaning - very mild process. SIZE HELP: M = UK size 18, L = UK size 20/22, XL = UK size 24, 2XL = UK size 26/28. Model’s height is 180cm (5ft 11in). For more information, please call customer services on +44 (0) 20 8455 0005, or one of our stores.